Dear people born of water and the Spirit: grace, mercy, and peace to you from God the Father and our Lord and Saviour Jesus Christ. Amen. If there are many ways to heaven, then it doesn’t matter what you believe or to what church you go. Do what you like. Find your own way that suits you. Go to whatever church makes you most comfortable. You can hear this as pure Law, as a command that you must be baptized along with your family. It certainly is Law, as Baptism is commanded by God. Rejecting Baptism is rejecting God’s promise to you. Baptism, however, is the most beautiful Gospel. How much better of a promise could God make to you? “Baptism… saves you,” the Holy Spirit tells us through Saint Peter (I Pet. 3:21). You are not saved by your own works or efforts. You are not saved by your own decisions, commitments, or prayers. If your salvation depended on these, it would never be certain. You could never know that you have worked enough, put in enough effort, made the right decisions, been committed enough, or prayed fervently and sincerely enough. Thus, God makes salvation so easy for you. Baptism saves. He takes the guess work out of it and takes the work of salvation out of your hands and into His own, so that it will be sure and certain. Baptism is not magic. It is God’s promise, and it is received by faith. That faith is also given by God in Baptism because He gives us His promise in Baptism. If you do not trust and believe God’s promise of salvation to you, then whose promise do you trust? Those promises that men make to you? Those promises that you yourself make? As opposed to all other promises, God’s promises are certain. Baptism cannot be useless, because what God institutes and commands and to which He attaches His promises cannot be useless. Baptism was not devised or invented by men. It was not spun out of some man’s imagination, but revealed and given by God Himself, so we can boast that Baptism is no human plaything but is instituted by God Himself. But here the devil sets to work to blind us with false appearances and to lead us away from God’s work to our own. It makes a much more splendid appearance when man is so dedicated that he goes on a difficult pilgrimage or when man dedicates himself to follow Jesus. It is impressive when someone makes a big donation to a charity or dedicates his life to serve those in an impoverished country. The achievements and merits of man are seen to be great and impressive. Mad reason rushes forth and because Baptism is not dazzling like the works that man does, it is regarded as worthless. However, Baptism is such a great work because it is God who baptizes. It is performed by the hand and voice of man, but it is truly God’s own act. It is God putting His claim on the one being baptized. It is God forgiving sins. It is God the Father, Son, and Holy Spirit putting His name on the baptized and giving His promises. So great is Baptism that it is the killing of the Old Adam in us and the resurrection of the new creature, both of which continue in us our whole life long. For we must keep at it without ceasing, always purging whatever pertains to the Old Adam, so that whatever belongs to the new creature may come forth. What is the old creature? It is what is born in us from Adam: irritable, spiteful, envious, unchaste, greedy, lazy, proud – yes – unbelieving; it is beset with all vices and by nature has nothing good in it. Now, when we enter Christ’s kingdom, this corruption must daily decrease so that the longer we live the more gentle, patient, and meek we become, and the more we break away from greed, hatred, envy, and pride. Where the old creature is given free rein and continually grows stronger, there Baptism is not being used, but resisted. Where Baptism is used, there is repentance. What is repentance but an earnest attack on the old creature and an entering into a new life? If you live in repentance, therefore, you are walking in Baptism. Baptism remains forever. 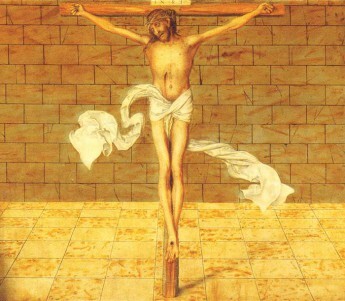 Even though someone falls from it and sins, we always have access to it so that we may again subdue the old creature. Baptism does not fade or wear out. Baptism remains forever because God’s promises in Baptism remain forever. The Son of Man was lifted up on the cross and there paid for your sins and you receive the results of that payment in Baptism, because you receive forgiveness of sins in Baptism. When you sin, remember your Baptism. Baptism saves. God has made salvation so easy for you. He has taken the guess work out of salvation by doing it all for you. Jesus died so that you will live, and He gives you this new life in Baptism. Your salvation is sure and certain because Baptism is sure and certain. The promises that God made to you in your Baptism remain true because God cannot lie. The only true God, Father, Son, and Holy Spirit has claimed you as His own. You have been born again. You have been born through water and the Spirit. Thus, you will see the kingdom of heaven. Amen.